Buy Hioki BT3554, Best Battery Tester Online. Accuracy guaranteed for 1 year, Post-adjustment accuracy guaranteed for 1 year. 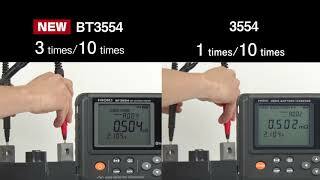 If you are looking for the best battery tester online, do not hesitate to check the latest hioki bt3554 battery test kit available. Indeed, Hioki is a famous brand very well known for its quality and robust battery tester. Furthermore, Hioki manufactures state of art and stable signal products. How Hioki BT3554 performs against Fluke or other? New protector delivers better ergonomic hold and durability in the field. Simply touch the test leads to the battery terminals to easily capture battery condition data with the Hioki BT3554 Battery Tester. Automatically save measurements results using the auto-hold or auto-memory function in just 2 seconds, a 60% reduction from the legacy product. Measured values captured by the Hioki BT3554 Battery Tester can be displayed and saved onto a mobile device wirelessly. The results can also be used to create automatic reports. Simply install the free GENNECT Cross app onto your mobile device and connect to the Hioki BT3554. Reports created on your mobile device can even be e-mailed to the office to further increase work efficiency. Data uploaded by the Gennect Cross app can also be loaded into a PC to view the historical state of the specified battery as a graph. By using its comparator function to simultaneously measure the internal resistance and voltage of a lead-acid, nickel-cadmium, or nickel-hydride battery, the BT3554 can generate comparative judgments quantifying degradation of the cell based on user-specified threshold values. The BT3554’s auto-hold function automatically holds measured values once they stabilize. The instrument’s auto-memory function, which automatically stores measured values resulting from the auto-hold function in its internal memory, further streamlines work tasks. The BT3554-01 features Bluetooth® wireless technology. Measurement data loaded onto a tablet or smartphone can be viewed using templates and graphed to allow assessment of data by the cubicle (up to 500 data points). In addition, the app makes it possible to instantaneously create reports while in the field. We Accept Credit Card Payment and Debit Cart Payment. We supply a wide range of Industrial Products made in United States and Europe. We love using Hioki BT3554 Battery Hi Tester ! !